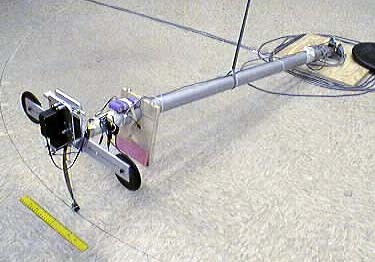 The BowLeg hopper is a novel design for a locomoting robot that hops on a flexible, efficient leg. The innovative design features a high-efficiency leg and a body with naturally stable attitude. The BowLeg concept is suitable for incorporation into self-contained, battery powered hopping and running machines that operate on real, rugged terrains. The BowLeg idea is protected under US Patent 7,270,589, "Resilient leg design for hopping running and walking machines", issued September 18, 2007. The work also contributed to the development of the patented BowGo, a human-ridable device. 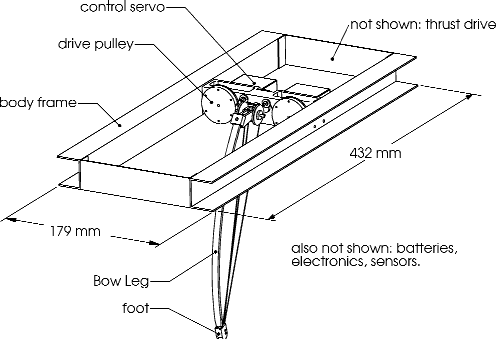 The first complete prototype using a BowLeg is the planar prototype constructed by Ben Brown and Garth Zeglin as part of Garth Zeglin's doctoral thesis work. 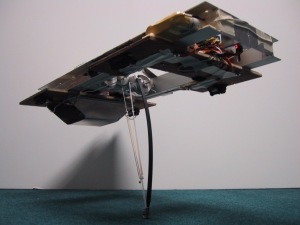 The combination of a freely pivoted hip and passive bounce allow the use of lightweight hobby servomotors for leg positioning and thrust. It is efficient enough to run on a small NiCd battery pack for 45 minutes. The thesis is concerned both with the development of this novel mechanism and controlling it to cross rugged terrain. The simplicity of the mechanism is reflected in the simplicity of the modeling and control. Currently in place is a search-based planning system that can compute paths in real time to cross sequences of stepping stones. The insightful mechanical design matches the natural machine dynamics to the task so the control can focus on interesting navigation tasks. A few more images are available. In the Spring of 2000 Ben Brown and Garth Zeglin constructed the first rough prototype of a 3D hopping machine using the BowLeg. This tested basic ideas of extending the freely pivoting hip to two DOF, and resulted in tests with a simple remote controlled without thrust. In the Fall 2000 and Spring of 2001 Jean-Christophe Zufferey visited CMU from EPFL. The 3D prototype was refined and rebuilt (shown at right, photo courtesy of Zuffera study of stabilization and sensing using the 3D BowLeg prototype.